Peter Savio is a wealth of knowledge and will be sharing his insight on an array of topics: Air B&B's, Monster Homes, Mass Transit Island Wide, Monetizing Hawaiian Home Leases and much much more! Beginning in 1980, Peter founded Savio Realty Ltd. and subsequently its affiliated group of companies. 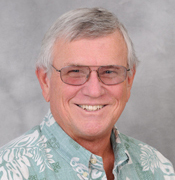 Peter has a good understanding of real estate and the Hawaii market in particular. Peter has helped his clients realize the maximum return on their real estate investments.